Here’s why you need to pop in soon. Ladies who lunch, gents who brunch and everyone in between, listen up—there’s a fun, stylish new option for Buckhead dwellers looking for delicious food in a delectable setting. Public Kitchen & Bar is the definition of a modern gathering spot. If you’ve been to Savannah lately, you’ve probably seen the work of the talented team at Daniel Reed Hospitality, including Managing Partner Jamie Durrence (who won the Georgia Restaurant Association’s restaurateur of the year in 2017) and Creative Director Robby Perkins. They are behind hot spots such as Artillery, Soho South Cafe, Local 11ten and the original Public Kitchen & Bar. Perkins’ midcentury updated-diner design for the resto was inspired by American painter Edward Hopper’s “Nighthawks,” and the menu closely follows Savannah’s outposts’ eclectic, something-for-everyone menus. 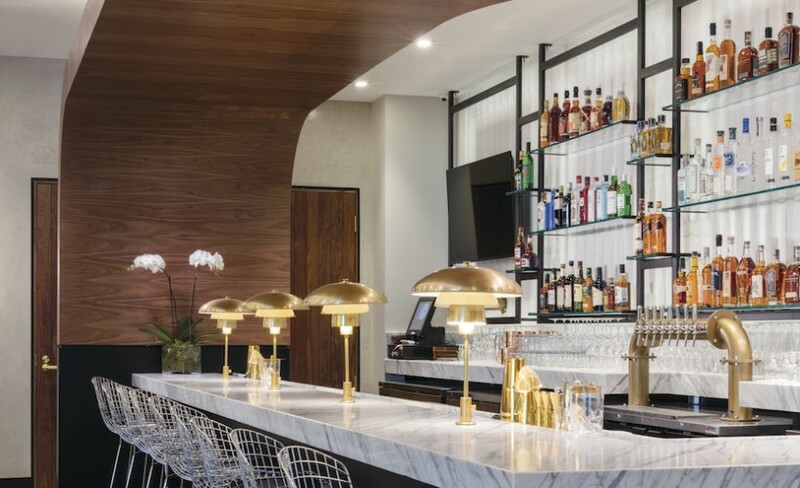 In part of the space formerly known as Twist, it’s pretty much a guarantee that the location alone will make this place an Atlanta staple, but use it as your command center midday, whether taking a business coffee meeting or lunching with girlfriends between Gucci and drooling over Givenchy at Jeffrey Atlanta. You’ll want to dash to one of three places, depending on who you’re with: a barstool for a tête-à-tête, tables by the fireplace for a rendezvous, or one of four semicircular banquettes in the back made for large brunch groups and girls’ night out. It’s not the most ladylike of orders, but who cares? The burger is about as fresh as it gets, with beef coming directly—as in zero middle man—from Durrence’s parents’ farm in Glennville, Ga. A variety of nonbeef choices exist as well, from a tuna nicoise salad to a Thai coconut red curry. Specialty cocktails with cheeky names and a variety of ingredients, such as the High Fashioned (High West double rye, Plantation 5 star rum, Peychaud’s bitters and black walnut bitters) satisfy. Artwork from Jackson Fine Art dons the walls thanks to a partnership with friend Anna Walker Skillman. Fashion-friendly touches—both Durrence and Perkins attended the Savannah College of Art and Design—abound and will make Phipps Plaza-goers feel right at home.